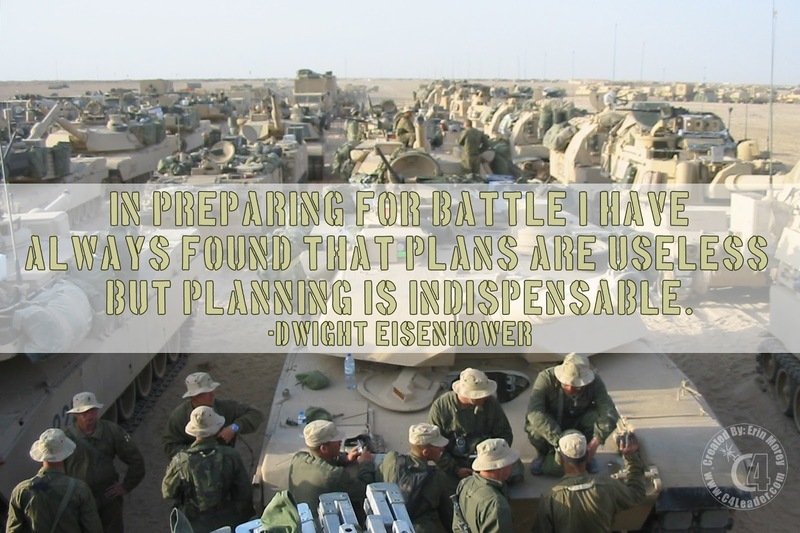 As a leader, you have to expect that nothing will go according to plan, and that you will need to adjust. That is why President Eisenhower said Plans are useless, but planning is indispensable. During Planning, take the time to at least perform a SWOT or Risk Assessment (coming in a future series of blog posts, stay tuned!) of the plan. Where can things go wrong? How will you address the problem when it does happen? As a secondary requirement to this, make sure your entire team knows the plan, including the Risk Assessment / SWOT and what the expected actions are if a problem arises. If everyone knows what is expected, then less time will be lost to indecision. Is the problem one predicted in the SWOT / Risk Assessment? If so, take a moment to ensure that the event is as expected before jumping into the pre-approved action (sometimes there are underlying reasons or situations that need to be addressed first). Adjust the action as necessary for the situation. If not, then identify what the real problem is you are trying to solve. Sometimes you will need to determine if you are addressing the real problem, or only seeing the symptoms to a larger / deeper problem. Perhaps use The 5 Why technique to determine the root cause. Once you know the root cause, define a course of action to correct the root cause. Implement the solution / course of action. Monitor the results of the course of action. Did it improve the situation? Is the issue resolved? Take a moment to step back and look at your plan. Can you continue with the original plan, or will adjustments need to be made? Perform an After Action Review (AAR) for the issue, to ensure you capture the Lessons Learned, and to improve for the future. At this point, you try to identify why the event happened, as well as how it could have been avoided, and was the solution / actions effective at solving the problem. Continue towards your objectives / goals / tasks / etc. Don't let a problem complete sidetrack your progress. These seven steps are basic, but have proven to be useful over and over again. The most basic lesson of Morey's Law #9 is that you must assume things will go wrong as you move toward a goal. There is no straight line to success. Be prepared to adjust the plan. Remember, situations rarely resolve themselves and bad news doesn't get better with age!